and the fact that he was able to come home last minute for four days before he heads overseas. And that we were able to carry off the surprise! Blurry, I know, but I love the smiles! I told the kiddos we were having a special dinner with Morgan, while he secretly snuck off to the airport to pick up dad. Meanwhile the kids and I prepared dinner and then I made them all hang out with me in the kitchen. Some, to remain nameless, whined about having other things to do, but I told them I was lonely and needed some attention! You should have seen the look on their faces and heard the squeals when dad walked through the door! Priceless! Wish I had thought to have the video camera ready, but oh well. Two burst out in tears and all have not stopped smiling since. Monday begins our new, official countdown, but this time hopefully we can start healthy and we can start knowing the days actually count towards the 365 count! I pray your Thanksgiving was blessed as well! I know tomorrow is a busy day for most of you, but if you are looking for a fun last minute activity to keep the little people in your life busy, I shared one of our favorites with The Schoolhouse Review Crew! Grab a few apples and have some fun! Happy Thanksgiving, Friends! May it be a blessed one. And may God open our eyes to see the many things in our lives we should be THANKFUL for! You Can't Even Make This Stuff Up! No kidding! Thankfully I am beginning to be able to laugh about some of it. Not all, mind you. That may not come. And as another friend suggested, I am going to start yelling PLOT TWIST and see if that helps me feel better. At the very least it will entertain the troops here at home. Week 1-The night of my husband's departure, my 7 year old began running a high temperature. This is the kiddo who doesn't do sick well and therefore freaks out and asks if he is going to die every few minutes. Fun times. The good news is that it is hard to be too emotional in saying good bye when you are sleep deprived and distracted. Two days later he got better and my daughter and I got sick. We headed to the doctor to be told she had a virus, me- bronchitis and pneumonia. Four weeks later, I am still coughing. Week 2- Back to doctor! Daughter got better, but oldest son was down for the count and diagnosed with pneumonia. I was put on a second round of antibiotics because I was not getting better. Oh, and the mice moved in while mom was in bed for 6 days straight! YUCK! Week 3- Back to doctor! Next daughter started feeling badly. At the very least she is worn out and the allergy thing is still not worked out. She is not feeling well, not sleeping and generally feels like dirt! Hmmm, could be from taking care of a sick family, stress of finishing her degree and working a job, plus college/church ministry and on and on! Plus while we were at the doctor's office the doctor turned on me, I mean turned to me, and said, "I notice you are STILL coughing. That is not good!" Add a steroid to my list of medicines. This is the family who does not like to take medicines, I remind you! Plus, we came home with more cough medicine with codeine, which my daughter begged him not to give me since it makes me cry. A lot! Funny how codeine works! For the sake of the family, I have refrained from taking it. I am nice like that. We also went back to the doctor the following day with the youngest because he too has developed a cough and the doctor is either concerned or just likes seeing us frequently. Medicine for him. Is it any surprise to you that the gal in the pharmacy actually called me by my first name, pondered out loud why we were back AGAIN and told me how sorry she was for us?! Then just to add to the fun, while I was out my 13 year old was "fixing" a pen that exploded blue ink on our bedroom carpet. I am still working on that matter. And yes, the same day as the doctor visit! Then I had to take the car in to get the oil changed and Farmer Dan's wife (who has had car issues of her own) said she could take me to pick it up. My chariot arrived, we chatted for a few minutes and then out to her car we went- yep, it was dead! You would have been proud of us- we just laughed. We should have yelled PLOT TWIST! With the help of another sweet friend, we got car picked up and I safely delivered 7 people to church for a few hours. I drug myself home for a few hours of quiet to only walk through the door to find the dogs had opened a glass bottle of natural supplements intended for the college daughter and had eaten 86 out of 90 of them! Brand new bottle! I spent the next hour calling vets and making the dogs throw up. And just possibly saying not so nice things to the dogs. More fun times. Then, I tried to put a storage crate away in the garage only to have it about fall on top of my head. Managed to duck in time, but my back may not be the same for weeks. Oh, and I fell in a store nights ago. Yep, embarrassed everyone and bruised my knee. Week 4- Today you will find us back at the doctor. Yes, you did count that right- four weeks in a row. More tests and various blood work for the oldest who is not getting better. See, you can't even make this stuff up. Such is the life of a military wife. Or any other spouse for that matter whose does life alone at times. Things just happen. Whether a significant other is around or not. The difference is we are suddenly doing it alone. There is no one to rescue us at the end of the day. No one to pass the baton to. No one to whine to. And so our friends see and hear much more than they normally would. We just air our dirty laundry more (you can thank us later) and therefore you see our lives as an open book. We probably have no more craziness than any other person reading this, it just can seem like it because it is center stage. Well, thank goodness. Not that our mess is center stage, but that our mess is no worse than your mess. I am however looking for the nearest vacation spot! You are welcome to come with me. Let's face it, some days are just harder than others. Some weeks are like that! I feel like I am stuck in one of those seasons. As I so often say to my close friends- KEEP YOUR EYES ON GOD! Yes, I am shouting that to myself. We need to teach our kids that when things are good we need to keep our eyes on God. And then when things get hard, we need to continue to keep our eyes on Him as well. How easy it is to take our eyes off God and drown in our own helplessness. I am a momma. I love my kids and I want to supply their every need. Make everything all better. I want them to come to me with all of their sadness, hurt, and pain. But before even that, I want to teach them to take all that to God first. I am human and I can only do so much! 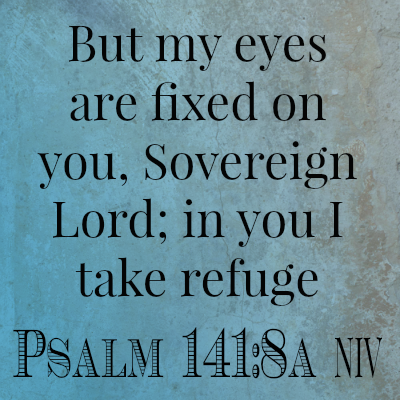 He is God, and He alone will give us refuge and sustain us! 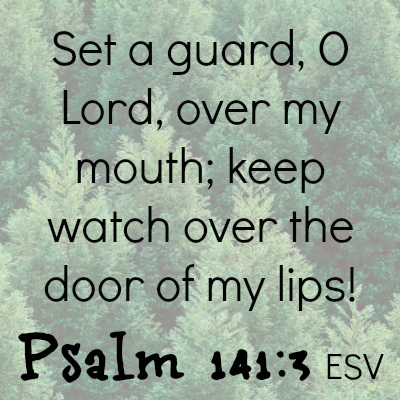 Teach your kids to keep their eyes on God and make Him their refuge! I have a confession to make. Although I love to read, I am not good at remembering authors. Sorry to all those amazing authors out there, but names I do not do well. I can describe a book at length if you will let me, but please do not ask me to remember who wrote it. There are few exceptions to the rule. Except Gary Chapman. Yes, his name I remember! Years ago I read his book The 5 Love Languages and his name was stuck in my memory. Great book, great author. Which is why I was so excited to be able to read and review his latest book, Growing Up Social- Raising Relational Kids in a Screen-Driven World , co authored with Arlene Pellicane. Electronics, screen time, social media, computers, Internet. Those are all things we are pretty familiar with in our home. I am a blogger after all. I have four kids. And two computers. And four lap tops. And an iPad. And several iTouches and iPhones . My family that is, not just me. But you get the point. We are no strangers to the world of screen time. Which is also why this book title caught my eye. And touched my life. And challenged me. In 14 chapters Chapman and Pellicane talk about he pros AND cons of screen time in our lives today. Here's the question they ask- "Is technology bringing your family closer together, or is it driving your family farther apart?" I think that is not only a fair question to ask, but an important one! The first 7 chapters actually concentrate on raising relational children, focusing on what the authors call A+ skills. In each chapter, Chapman and Pellicane address the specific A+ skill and how as a parent we can teach them to our children. In addition, they discuss how screen time can harm those traits as well as help those traits. Yes, screen time can be used for good. That is one of he reasons I really liked this book. It is not a media bashing book. It truly is an objective look at how media screen time affects are lives- for good and bad. That is a lot of time! But on the other hand, modern day advances in electronics allow us to skype with grandparents across the world and learn skills they would have never otherwise been exposed to if not for computers . The trick is finding the right balance for your family. Each of these areas are looked at objectively, and not just at how they affect young people, but adults alike. Be forewarned, it can be convicting. Like are really giving our children our full attention? Are kids learning how to interact with people by watching us or how to hide in a world of electronics instead? Are we using screen time as a babysitter? Chapman and Pellicane do a good job throughout the book at pin pointing potential bad habits that you may have established and things that you can do to replace those habits with better ones. Instead of bashing media, it encourages you to use caution and discernment and make rules along the way that fit for your family. While one hour of electronic time may be fine for one family, it may be too much for another. Only you can determine that, but Growing Up Social gives you some good food for thought to help you in that process. Would I recommend this book? Yes! To every person out there. But I would warn you that you should go in reading it with an open mind. Only you know your family, and only you have the responsibility to make the right decisions for them. Growing Up Social is a good book to put you on the right track to do so concerning screen time and the place it has in your life. In addition, Growing Up Social has group discussion questions for each chapter that make it perfect for a book club or other discussion group. 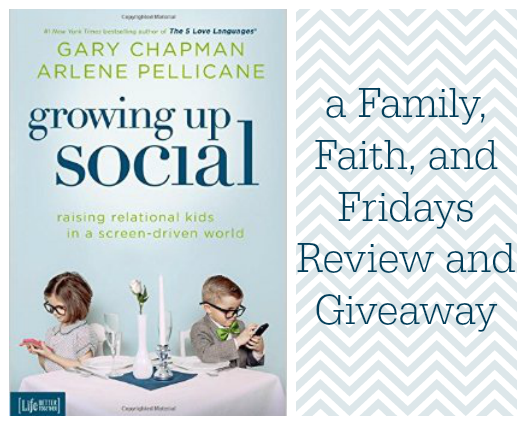 We are blessed to be able to give away one copy of Growing Up Social! Just leave a comment for us and tell us, what rules does your family have concerning screen time and your kids? A random winner will be selected next Tuesday! This week I posted my final Schoolhouse review of the season. It is time to slow down and take a break for a few months before starting back up with them again in February. There will be a few independent reviews and a few giveaways for the holidays, but for a few months you will get just us on the blog! To keep you busy next week we will have a week-long series you will not want to miss out on. Blue Ribbon Awards- Homeschooling's Best! This past year I have had the opportunity to use and review over 25 homeschool and family friendly products with the Schoolhouse Review Crew which falls under the Old Schoolhouse Magazine. To say that it has been a privilege is an understatement. Not only have each of those products blessed my family, but they have provided me with the opportunity to be able to share with and mentor many homeschoolers- new and veterans alike. I love that! My kids have been exposed to new things we would have never known existed and we have broadened our horizons with curriculum. Each year, at the end of our Crew "year", the reviewers have the opportunity to vote for their favorites in many different categories. It is a long awaited opportunity and a way for us to be able to give back and say thank you to the many vendors who allowed us to review their products. I want to quickly share with you a few that we voted for- just a recap of some of our favorites and then I invite you to follow the banner to the official winners. See for yourself if any of our favorites, or yours, won. Language Arts- Lightning Literature We have reviewed Hewitt Homeschooling before and really liked them, but this year we actually began using their Language Arts full time for our 2nd and 7th grader. Love it more every day! Favorite History- Veritas Press Big surprise, right!? ha Yep, I will sing this program's praises until my dying breath! If your child likes computer based learning, you have got to check this out! Favorite High School Resource- Victus Study Guide This is one of those programs I really didn't know we needed until we used it. It is simple to use and will not take up a lot of time, but it is full of useful information of how kids study and how to improve their study skills. We have seen a lot of progress after going trhough this program. Favorite AudioBook or Drama- Let me share two (hey, Christmas is coming and you might need multiple ideas!) Brinkman Adventures and Under Drake's Flag! Our whole family loves both and they get listened to over and over again! Just can't beat them! Favorite Mom Resource- Flourish, by Apologia Yes, sometimes I get to enjoy the fun packages that arrive at my door weekly, too! This book I love! Not just for homeschoolers, if I could buy every friend a copy I would. It is just that good. And it inspires me. Link goes live Monday morning at 8:00! Oh be careful little mouths what you say, oh be careful little mouths what you say. For the Father up above is looking down in love, Oh be careful little mouths what you say. Does for me. We used to sing that song to our little kids all of the time. It's cute. It's catchy. And boy is it full of truth! We need to start singing it again. Trust me. We have one child in particular that tends to lash out in anger with ugly, often hurtful words. It is his line of defense. I am mad. I will say mean things. I am confused. I will say mean things. I am scared. I will say mean things. I am tired. I will say mean things. I feel threatened. I will say mean things. We are working on it daily, but it surprises me almost every time. How can this sweet, loving boy turn into such a hateful little guy so fast? We have talked about how your words have consequences. How once you say something you cannot take it back. How once you hurt someone, they tend not to trust you anymore. How it grieves God's heart when you say unkind things. It is a heart issue, I know. Something deep inside of him that he can't quite put into words yet. But he is working on it. He is not alone. Because every time I point out to him that speaking unkindly is a sin and that when we sin we are hurting not only ourselves and others, but we are also hurting God, I wonder how often I, too, have a heart issue. How can sweet me turn into a hateful person so fast? How often do I get mad and say mean things? How often in my confusion do I say mean things? How often do I get scared and say mean things? How often do I feel tired and say mean things? How often do I feel threatened and say mean things? I am working on it too. And so instead of just singing the song, this week we are reciting the verse! Over and over again! Let us not sin in anger! 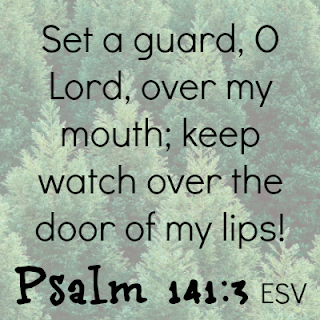 And let us allow the Lord to close our mouths and heal our hearts! 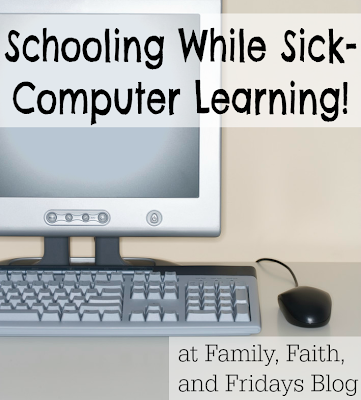 Schooling While Sick- Computer Learning! In case you missed my whining on Facebook, I have been sick for two weeks. I was in bed for six days of that time, either asleep or coughing. Pneumonia and bronchitis will do that to 'ya! It was NOT fun! Still isn't, but, hey, at least I am out of bed and I think the second round of antibiotics has finally worked. At least, I hope so. So what to do when you are a homeschooling mom that is sick in bed? Those are the days I was, and am, very thankful for computer based programs! Seriously. Here's a confession. 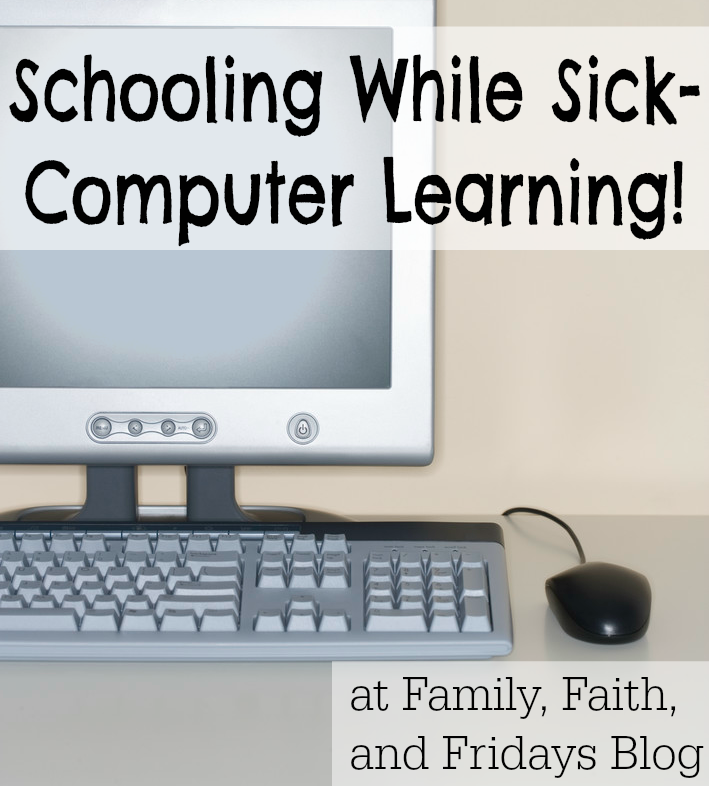 Once upon a time I was one of those moms that scoffed at computer based learning. I mean, why would you commit to school your child and then put them in front of a TV or computer screen? Doesn't that defeat the point of you teaching? Little did I know and lots of apologies do I owe! I still may not ascribe to full time computer learning for personal reasons, but I have come to appreciate the value and reasons behind it. If it had not been for some of those very programs, one of my children in particular would have done no school this past two weeks. That is reality. History! If you have not heard me rave about Veritas Press Self Paced History, hear me do so now. This was one of those review items I did for Schoolhouse Crew that I did not realize would bless us as much as it has. It is just the best history I have found. 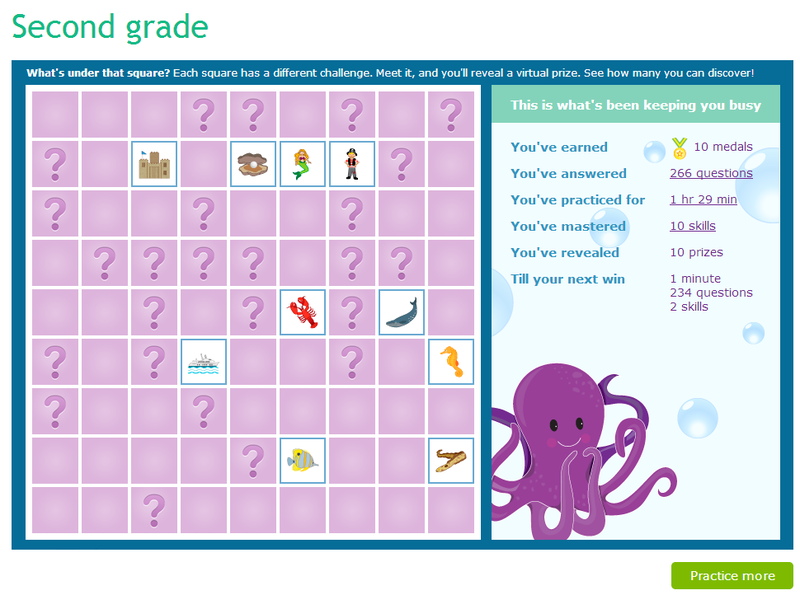 My second grader is able to log in and view the lessons, do the activities and take the tests with no help from me. I will admit I usually view the lessons with him because I enjoy them as well and have learned a lot from it, but for the past few weeks he has been on his own. And even completed two lessons on several days! Math! This is where IXL has been a huge blessing. Since it is a review based program, he may not have advanced into a new subject, but he has certainly not fallen behind. Again, he was able to log in and review math concepts for 15-30 minutes a day. Language Arts! Again, IXL to the rescue. Some of the concepts for his grade level have been new to him, but because you have access to all levels he knows he can go back and review 1st grade material as well. Another program we have used for over a year now is Reading Eggs. This is more game based and flashy, but CJ loves it and so do I! His reading soared by leaps and bounds when he first started Reading Eggs and he continues to do well with it. I love that it covers reading comprehension, sight words, grammar and more. He is required to do a level a day to "unlock" his 30 minutes of free computer time or a 30 minute movie. OK, so it may not be a complete day's worth of curriculum, but for a sick mom, it is a small victory! And the glory of schooling year round is that we are not in a race against the clock or the calendar. Yay me! Yay homeschooling! And yay computer based learning! What about you....do you have a computer base program you use and love? I think I am ready to add a few more to our list and we would love to have you share what works for you! If you have reviewed something you love and use, feel free to leave us the link! *I am getting no compensation for mentioning these companies. The opinions expressed are mine alone and based on our family's experiences. Excited yet? I am getting there. We LOVE Christmas time in this house. Baking, buying gifts for friends, homemade crafts- traditions that we began years ago and look forward to every year. One of our favorite traditions is reading special Christmas books each night. So when we had the opportunity to add If He Had Not Come to our ever growing collection, we were thrilled! 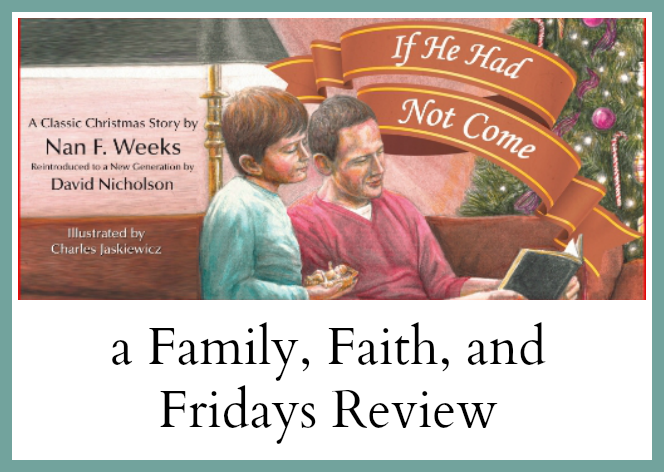 If He Had Not Come, a tale written by Nan Weeks many years ago, and reintroduced to the world by David Nicholson, is a story told through the eyes of a young boy who imagines the world without Jesus. The story captured David's heart when he heard it in Sunday School and it was then that he vowed to read it to his family every year at Christmas time. That vow later resulted in the publication of this beautifully illustrated, stunning tale of what the world might possibly look like if Jesus has never come. Bobby sees no evidence of Christmas celebrations. No trees, no wreathes, no presents. As he ventures outside, no one he meets even knows what the word "Christmas" means. Throughout the town young Bobby finds everyday places and people gone, replaced by the words If He Had not Come. The most poignant of all is when he returns home and looks in his Bible and the entire New Testament is replaced with those words instead. Bobby then wakes up, the illustrations become vivid again and he thanks Jesus for coming to the world and vows to do what he can to please Him. I have to tell you that I liked this book a lot the minute I read it, but was not sure how my children would feel about it. Especially the youngest, age 7. I read it to him and since then he has reread it on his own over and over again! The first few days we had it, it was in his hands constantly and I could find him curled up in a chair with it. When I asked him why he liked it so much he said, "I like all of the pictures of the boy." It is funny how some books just capture you and If He Had Not Come seems to be one of those books. 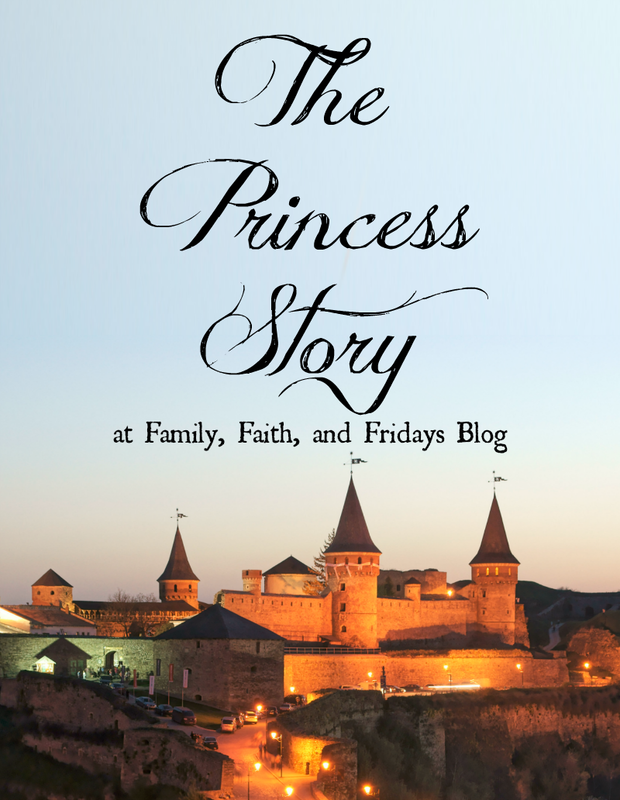 This is a book that may not be your typical holly jolly Christmas books, but it is one that will fill you and your family with hope and thankfulness. One of the bonuses for this book are the Interactive Topics in the back for families and teachers alike. These topics and questions are a great jump start for conversations after you read the book together. Some questions are scripture based questions and some are merely what would you do or what do you think questions. I liked that because there was a little something there for all age groups to ponder. My favorite question- "What other things would be good to think about on Christmas morning along with presents?" The ABCs of the Gospel message are also clearly laid out for anyone who has not been exposed to them and for anyone who would like to receive Jesus as their Savior! What a beautiful and appropriate way to end a book with such an important message. Our lives would be so different if Jesus had not come. I pray you and your family have experienced that truth and His love! If He Had Not Come can be purchased for $18.95. You can also find If He Had not Come on Facebook! Days are busy. Life is full. And sometimes getting all of the school subjects in for the day is a challenge. For us, that is when computer-based learning is valued more than ever. That is also why we love IXL! 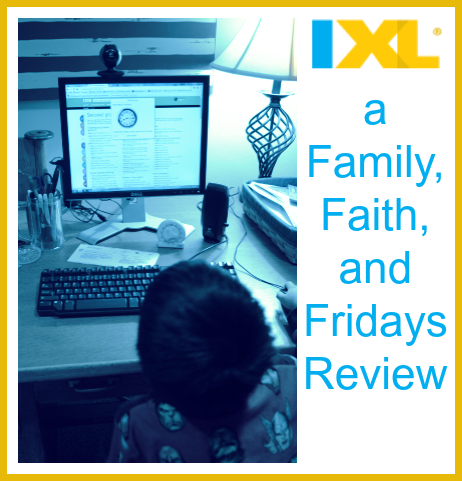 We had the opportunity to review IXL a year ago and had a good experience with it, but since then they have added a new subject and expanded and I was eager to try it again. 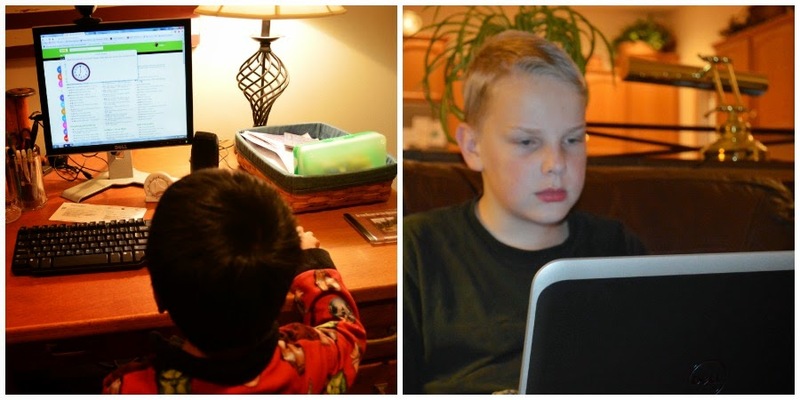 We were given a years access to IXL Math and IXL Language Arts to try with our three youngest. IXL is a review based program. While concepts are not taught per say, they are explained in pretty good detail if you get a problem incorrect. No matter what grade level your child is at, once you sign up for IXL you have access to all grades. For Math that covers grades Pre K through Pre-Calculus (12th grade). For Language Arts that covers grades 2nd-8th. I have found that the advantage of this is that you can easily identify strengths and weaknesses in your child's learning. Let's face it, no math or grammar program is perfect and your child WILL be less proficient in some areas. This is where I find IXL invaluable. Once we identify an area of weakness, we are able to go directly to that area and have additional practice. Once you choose a grade you want to work in, you simply access that menu and the skills are broken into categories that are well labeled for ease. Because you can access any grade, we have also gone back a grade to work even more on a specific skill. IXL is quite easy to navigate and therefore takes little if any supervision. Because of that, there is a pretty extensive parental page. From there you can access grades and progress, often in chart form, as well as see what areas your child is having a hard time with. In addition, weekly updates are sent to your email so you can see how much time a child has spent on the program and in what areas. Again, this is a review program, so we have used it as such several days a week. Our 2nd grader has used it the most and prefers the math section over the Language Arts. Some days we use it as simply a review and I require him to do at least 10-15 minutes of work. Other days when life gets the best of us, it becomes our math and grammar for the day and he works at least 30 minutes. When we first began he worked in the order of the menu, but he soon found areas he enjoyed more than others and would choose those first. Measurement is one of his favorites! One the right side of his screen a timer is displayed that shows how long he has been working. That option can be turned off, but once he realized it was not a race, but simply an indicator of time spent and part of the things that earned him "prizes" he relaxed. Also shown are the number of problems attempted, your score and ribbons earned. Combinations of time, sections completed, and number of problems completed earn the child "awards." Once they earn awards they are able to access a screen that looks like a grid with question marks on it. Certain stars are then revealed with "prizes." Don't ask me why, but that is a HUGE incentive for my youngest son. HUGE! As a matter of fact, because the Language Arts is a newer program it does not have this feature yet and I realized that is why CJ does not like doing those activities as much. You still earn ribbons, but for him- it is all about those picture prizes! Whatever it takes, huh? That, on the other hand, is exactly why my 7th grader did not enjoy the program as much. While he does not mind the review, the prizes seem babyish to him and he would rather just avoid it all together. His math skills are pretty strong so we found him to be spot on with his grade level and even beyond, but have seen a few more challenges with his Language Arts. I intend to use IXL Language Arts this summer as part of his summer review- not only to bring him up to speed but also help fill in a few gaps that I have seen we have. The whole point of me adding my 17 year old to the review was for ACT test review. Because she is currently quite busy with online college classes she has not been able to spend much time on the site, but we have explored the areas extensively and are convinced it is a perfect way to review for tests required for college admittance. Because of that, she will be spending the next few months doing 15-30 minutes a day. Since so many of those tests cover several years worth of subject matter, gaining access to Algebra, Geometry, and Pre-Calculus is a huge advantage. Instead of having to dig out all of her old books, the skills she needs to review are all in one place. I am not always sold on online programs and especially do not gravitate towards game like ones with a million bells and whistles, but I really like IXL. The review is strong, the detailed explanations when needed are good and the subject matter is extensive- over 4,000 skills are taught. Whether your child needs some extra help and review or you are just looking for a supplemental program for those days when it is just hard for mom to sit down and teach, I think you will find IXL will meet your needs! Pricing starts at $9.95 a month or $75 per year for one student. Each additional child is $2 a month or $20 per year. So two subjects for one child would cost $129.00. 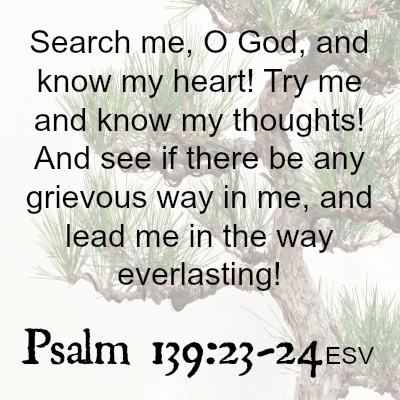 Psalm 139 is my favorite chapter of the Bible. One day I hope to be able to memorize the whole thing. The first time I heard it was while watching a VHS (remember those?) of Michael W. Smith in concert. He prayed Psalm 139 and at the time I had no idea it was scripture. I was in high school and I just remember thinking wow, what a prayer. Years later, after being saved and while reading through the Bible, I ran across those familiar words. It was like a revelation- I too could pray that prayer. The whole thing speaks to me, but today I want to point you to two particular verses- 23 and 24. In the NIV translation part of the verse reads "Try me and know my anxious thoughts." I have had some pretty anxious thoughts lately. 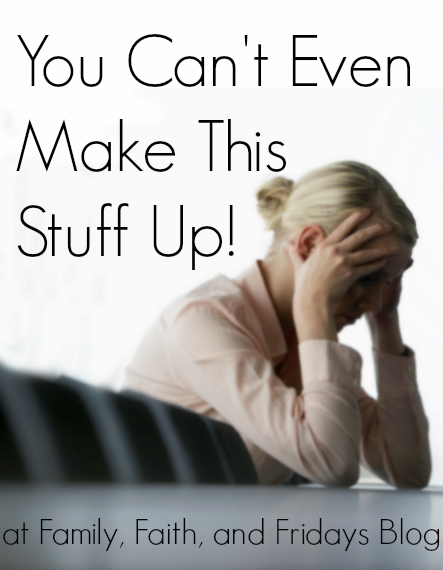 Our family got very sick the day my husband left and have been sick since. Four out of five of us have been down for the count and thank goodness the oldest was spared and is able to run a household. A friend commented on how sorry she was because she knew how hard it was to be a mom and sick at the same time. No worries- I haven't been a mom for the past week! Just keeping it real! I did however lay in a bed for 6 days straight. And since then, I often head right back there after being up for more than an hour. Pneumonia and bronchitis will do that to you. Bed has become my place. And it has given me a lot of time to feel anxious. What if I get even sicker? What if we cannot take care of ourselves? What if we cannot get through this next year without my husband? What if we misread God and should have retired instead? I spiraled down into a pit of panic more and more everyday and realized I had the potential to take the kids right along with me. Anxious thoughts have a way of doing that to you. They affect you and they affect those around you. They can cripple us with irrational fear. And they are not from God. I know that. I tell friends that all of the time. But man, when it is you going through a crisis, things can look very different. You stop seeing truth and you hyper focus on lies. And it grieves the Lord. So my prayer for the past few days has been for God to know those thoughts (He does!) and help me take them captive (He can!) To help pull me out of this pit. Because on my own I am not able. Our circumstances are not a surprise to God. Depending on what you believe, at the very least He allowed them. At the most, He orchestrated them. I do not like the way my life looks right now. Heck, I do not even like the way my heart looks right now. I do not understand things. And I feel like my sweet, simple life just got turned upside down and shaken. 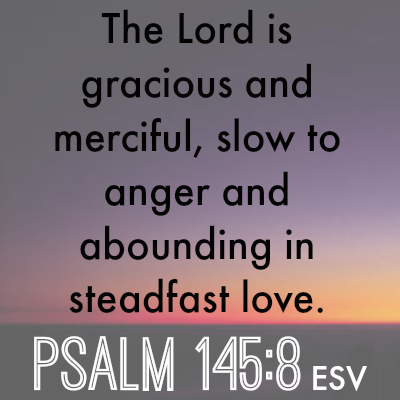 But minute my minute, and trust me when I say it has to happen about every minute, I am asking God to search my heart, find those anxious thoughts and help me move past them to crawl out of the pit of despair and into His everlasting truth and life. If we can pray for you, please let us know. Anxiety and despair are hard, but you do not have to suffer alone! When I read that introduction to the book Their Name is Today - Reclaiming Childhood in a Hostile World, I was intrigued immediately. Yes, I believe that the world has turned into a hostile place. And yes, I believe that our children are losing their childhoods at an alarming rate. How else do you explain kids half-dressed like the "stars" of today, high suicide rates and middle schoolers stressed out over test results? We are robbing our children the chance to just be kids and, like author Johann Christoph Arnold, I believe it is time that we do something about that. In this 192 page, softcover book, Arnold dedicates 10 chapters to how he thinks we can do that. Some of his ideas are as simple as allowing kids to spend their time playing and not overscheduling them. Others include reminding ourselves that all children are gifts from God and need to be treated as such. Through personal stories from his own childhood and from many people around the world, Arnold encourages parents and teachers alike to not only value children but to enjoy them as well. His often heart-tugging words will make you want to put all other things aside and embrace your children. My favorite chapter? In Praise of a Difficult Child! This chapter is for you moms and dads who are raising a spirited child or children. It will speak to your heart as you nod your way through each word, I assure you. "...instead of envying the ease at which our neighbors seem to raise perfect offspring, we will remember that rule-breakers and children who show their horns often make more self-reliant and independent adults than those whose limits are never tried." (p 127) I do not know about you but that is a refreshing reminder and one that I needed to hear. 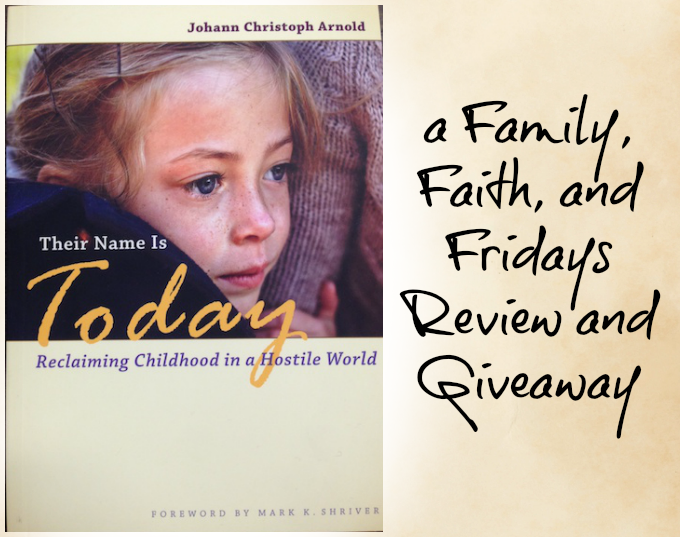 About author Johann Christoph Arnold - A noted speaker and writer on marriage, parenting, and end-of-life issues, Arnold is a senior pastor of the Bruderhof, a movement of Christian communities. With his wife, Verena, he has counseled thousands of individuals and families over the last forty years, as well as serving as an advisor at several innovative private schools. Arnold’s message has been shaped by encounters with great peacemakers such as Martin Luther King Jr., Mother Teresa, Dorothy Day, Cėsar Chavez, and John Paul II. Born in Great Britain in 1940 to German refugees, Arnold spent his boyhood years in South America, where his parents found asylum during the war; he immigrated to the US in 1955. He and his wife have eight children, forty-four grandchildren, and one great-grandchild. They live in upstate New York. You can enter to win a copy of this book, but leaving me a comment! We will draw a random winner next Friday!